German physicists have discovered evidence suggesting that we are all merely elements of a complex computer simulation. 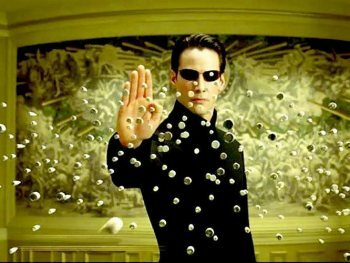 I'm sure you all remember The Matrix but on the off-chance that you weren't paying attention or somehow forced yourself to forget the whole thing after watching those awful sequels, it turns out that humanity exists within the confines of a highly-detailed computer simulation created by the machine overlords. And now German physicists have come up with evidence showing that this might actually be happening. The whole thing is based on the idea that any sufficiently advanced civilization will eventually create a simulation of the universe, which would of course lead to the creation of more such simulations within the original simulation. So it would continue, eventually resulting in a huge number of simulations nested within simulations, making it statistically probable that the universe we inhabit is in fact merely a simulation. It's a thought experiment, apparently a fairly famous one, but researchers at the University of Bonn say they have evidence that this could actually be the case. As Phys.org explains, a simulated universe would have an "underlying lattice construct" that would impose a limit on the amount of energy that could be represented by energy particles. And the University of Bonn team has found evidence that something very much like those limits do actually exist in our universe. One example of such a limit is found in the Greisen-Zatsepin-Kuzmin (GZK) limit, "an apparent boundary of the energy that cosmic ray particles can have." It's caused by "slowing interactions of cosmic ray protons with the microwave background radiation over long distances," according to Wikipedia, but the Bonn team says that it also exhibits the same kind of behavior you'd expect to see in a computer simulation. It may not be proof that we're living in the Matrix, but it is a pretty cool idea. The actual science behind it all is thick and heavy, as demonstrated by the abstract for "Constraints on the Universe as a Numerical Simulation," which explains, "Using the historical development of lattice gauge theory technology as a guide, we assume that our universe is an early numerical simulation with unimproved Wilson fermion discretization and investigate potentially-observable consequences." But if you want to take a crack at it - hey, free your mind, right? - you can download the paper in full from arxiv.org.